Serves 6-8. Preparation time 10 minutes. Cooking time 20 minutes. This is a prawn dish typically served in the southern states of America. Don't let the long list of ingredients put you off- most are to make a flavoursome stock you use to cook the prawns. Adjust the recipe according to the spices in your cupboard. Some variations of the dish leave out the smoked sausage -you could just as easily throw a handful of fried bacon over the cooked prawns. It's fun to make and eat around the campfire, and there are no dishes to wash afterwards! There's nothing elegant about this dish -you eat with your hands. • Use a large pot Add 4 tablespoons of the mixed spices, plus the onion, garlic, beer, water, stock (or fish sauce) and bay leaves. Bring to a boil. • Let the mixture simmer for 10 minutes and then cool down slightly. In the meantime, make the flavoured butter - put all the ingredients in a small pot and melt the butler without letting it boil. • Clean the prawns. Spread a big sheet of brown paper out on the table and put out bowls for the prawn shells. • When you're ready to serve, bring the pot to a boil again. Add the baby potatoes and mielies and add enough water to cover the vegetables. Simmer for 10 minutes or until the potatoes and mielies are cooked. 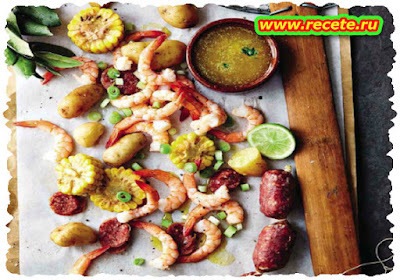 • Remove the prawns and vegetables from the stock and spread out on the paper with bowls of the hot butter sauce and the remaining mixed spices. Keep Tabasco on hand for those who like more spice. You can also dip prawns in a bit of mayonnaise.